Hundreds packed the New Mount Pilgrim M.B. Church in West Garfield Park to hear ideas from five Chicago mayoral hopefuls – La Shawn Ford, Amara Enyia, Toni Preckwinkle, Willie Wilson, and Lori Lightfoot – on how they would help enact a more progressive agenda should they win the election in February. Chicago 2019 mayoral hopefuls La Shawn Ford, Amara Enyia, Toni Preckwinkle, Willie Wilson, and Lori Lightfoot at a candidate forum in Garfield Park. Photo by Aaron Cynic. The candidates heard testimony from community members centered around issues like education, housing, public safety, and neighborhood investment and then were asked to respond with a one-minute answer on how they would help address them. 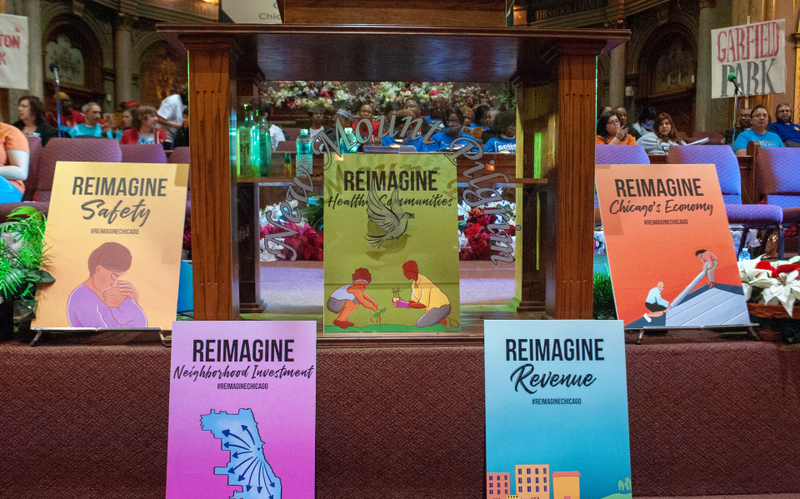 Dozens of community groups were represented at the forum, dubbed “Reimagine Chicago,” which was hosted by the Grassroots Collaborative, a coalition made up of progressive organizations in Chicago. The coalition is pushing an ambitious plan for mayoral candidates “to transform Chicago into a city that works for everybody through targeted community investment, expansion & protection of affordable housing, police accountability, jobs programs, and progressive revenue,” according to a media release sent out prior to the forum. The five candidates were chosen based on votes from leaders of member organizations and partners of the Grassroots Collaborative. Illinois State Comptroller Susana Mendoza was also invited but cancelled last minute due to illness, according to organizers. During a lightning round after the testimonials, the mayoral hopefuls were asked if they would support seven specific proposals, and their answers were tracked in real time and displayed on a large screen hanging at the front of the church. Hundreds packed the New Mount Pilgrim M.B. Church in West Garfield Park for a mayoral candidate forum. Photo by Aaron Cynic. All five committed to putting at least $25 million into mental health services and reopening public clinics shuttered by outgoing mayor Rahm Emanuel, supporting free tuition at Chicago City Colleges, ending student-based budgeting at Chicago Public Schools, abolishing the city’s gang database, calling for a delay on mega-TIF proposals, free transit on the CTA for seniors and youth, and calling on City Council to put the brakes on a proposed new $95 million police academy slated to be built on the West Side. A commitment card attendees at a mayoral forum on the West Side were asked to sign. Photo by Aaron Cynic. At the close of the forum, candidates were asked to sign a large commitment card onstage pledging they would meet with the coalition before inauguration day, include a representative on their transition team, and keep their positions stated at the forum. Only Willie Wilson declined to sign.